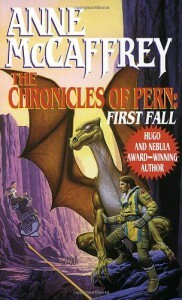 The Chronicles of Pern is one of the many Dragonriders of Pern books, one of my favorite series. This book is a collection of five short stories which take place before and after Dragonsdawn, which detailed the Pern landing party and colonization. It has been a while since I have read the series and a few of the stories would have benefited more from me being more familiar with Dragonsdawn, but it was still enjoyable. The first tale is fun in that it explains how the planet was named: Parallel Earth; Resources Negligible. My favorite story was the fourth and longest, where they plan to set up more Weyrs. At the time they only had one for the dragons, but with the expanding colonization of the planet and growing number of dragons, they needed more. It introduces Torene, who is mentioned in the first book Dragonflight, and her ability to hear all dragons. We also see the first instances of the popular practice of shortening your name when you become a dragonrider.